(They don’t want to spend a lot of time worrying about whether or not their event will be a success. It should be a “given”). What you don’t want to happen is that something goes wrong at your event and your DJ has that “what do we do now?” look in his eyes. 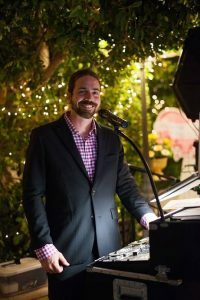 DJ Keith has been in business for over 7 years, and – with hundreds of events under his belt – there’s little DJ Keith hasn’t experienced nor dealt with. While DJ’ing may not be considered a rocket science, it does demand addressing “the little things” and being able to multi-task (i.e dealing with the unexpected things that inevitably will crop up and having a “feel” for the unique musical tastes of your guests – especially considering the increased diversity of our population in general). Has a deep knowledge of many styles of music. Knows how to quickly analyze and adapt to diverse crowds and situations; for example, knowing what song to play at the appropriate time and volume. Knows to let the music speak for itself. In other words, we will only be on the microphone when requested. Has a sense of FUN presented in a non cheesy fashion. Expert Analysis – DJ Keith knows how to read diverse crowds for 4, 5, 6 hours at a time and play the best music possible during that time. He will not play the same music for your event that was played at last weeks event. Each event is unique in it’s own way! Appropriate Use of the Microphone – DJ Keith will make all the necessary announcements with the appropriate intonation and then will put the microphone away. DJ Keith will not be out on the dance floor begging guests to dance or interupting your guests with unnecessary banter. From years of experience it’s been proven that if great music is being played it speaks for itself. DJ Keith keeps up to date with all styles of current music and is already an expert on the “oldies”.